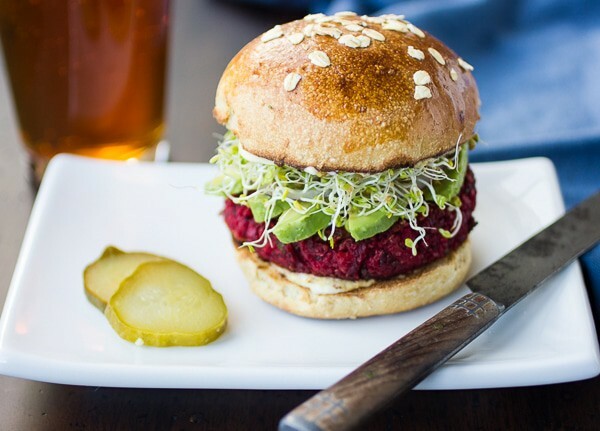 This Beet Burger with Chickpeas and Quinoa has it all! Color, taste and nutrition. With a delicate texture and earthy flavor, this is a healthy beauty you will find yourself craving. Many thanks to Wendy for having me guest post on her beautiful site! I’m Alanna, the recovering pastry chef behind The Bojon Gourmet, and lover of the Andean super-grain. 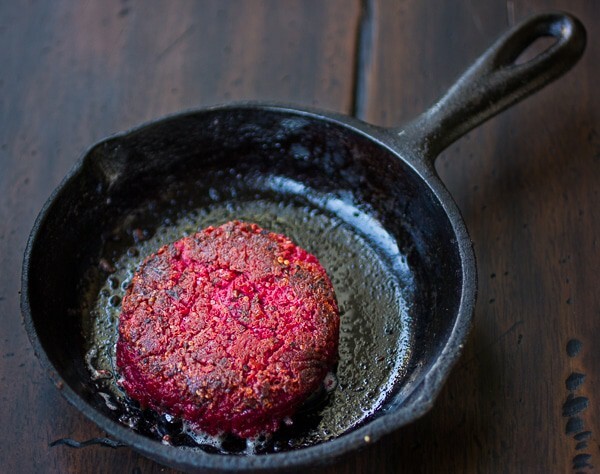 I’m happy to share a favorite quinoa recipe today: Beet Burgers with Chickpeas & Quinoa. 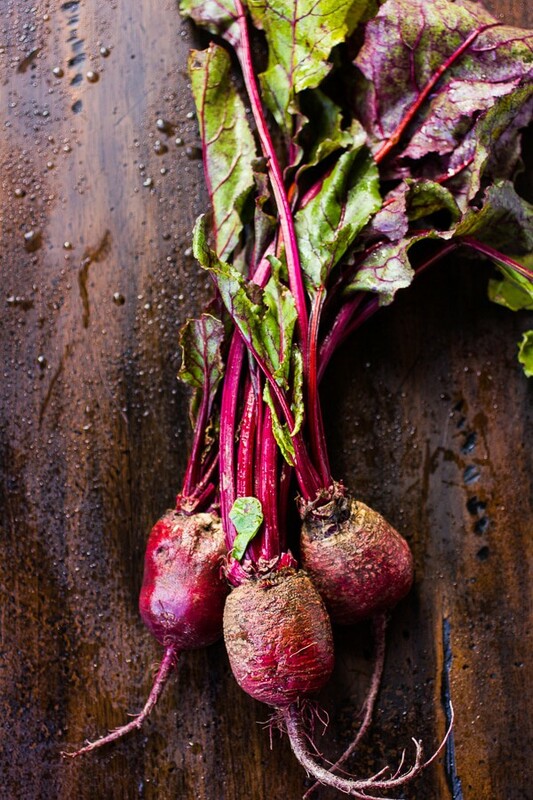 These burgundy beauties have a delicate texture, with the earthy flavors of beets, beans, and grains all bound together with a little egg and oats, and laced with lemon and parsley. I like to make my own buns as they are heads and tails above store-bought, but you can also forgo the bread altogether and serve this with a little yogurt sauce and a salad. 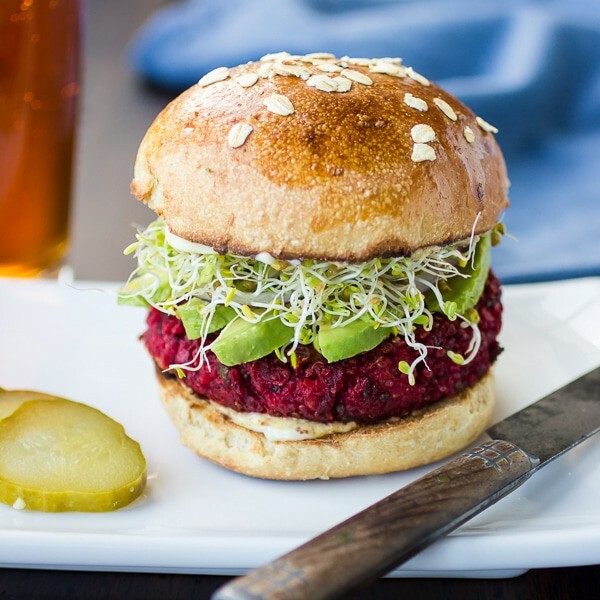 This Beet Burger has a delicate texture and earthy flavors that you will find yourself craving. They can be made ahead, making them perfect for your busy work week. 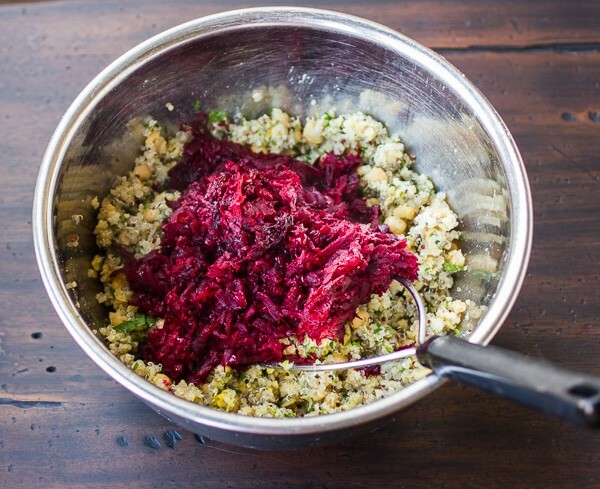 Cook the veg: Peel the beets with a potato peeler, then grate them on the large holes of a box grater. The beets will spray, so wear an apron and have your work area clear of things you don't want covered in tiny red specks. Heat the oil in a wide saute pan (that has a lid that you will use later) over medium heat. When it shimmers, add the onion and cook, stirring occasionally, until tender, 5-10 minutes. Add the garlic, the grated beets, and a big pinch of salt. Give it a stir, then cover the pan and let the mixture cook, stirring occasionally, until the beet is tender, 5-10 minutes. Remove from the heat and deglaze by adding the vinegar and stirring up any good stuff that is stuck to the bottom of the pan. Make the burgers: In a large bowl, combine the cooked chickpeas, quinoa and beet mixture and mash with a potato masher to break up the beans slightly - the mixture should still be fairly chunky. Stir in the parsley, lemon zest and juice, egg, oats, and 1/4 teaspoon salt until combined. Cook the burgers: Divide the mixture into 6 equal portions (a large spring-loaded scoop works well) and shape into 1" thick rounds. Coat the bottom of a wide skillet with oil and heat over a medium flame until the oil shimmers. Carefully add the burger patties. Cook until the first side is golden, 2-3 minutes, then flip and cook on the second side until it is golden and the burger is cooked through, 2-3 minutes, reducing the heat if the burger is browning too quickly. Serve the beet burgers on toasted buns slathered in any toppings you like. If you don't have 8 hours to soak your beans, you can cover them in boiling water and let them sit for 1-2 hours, or just cook them from dried; they will take a bit longer to cook. I like to cook my own beans, as directed below, but you can try using canned or jarred ones if your prefer; these tend to be firmer and may cause the burgers to not hold together as well. The half cup of dried beans that I cooked yielded 1 1/4 cups of cooked beans, but you can throw the whole can in, which should contain about 1 1/2 cups. In that case, you won't need the bay leaf. I'm guessing that you could omit the egg and substitute 1-2 tablespoons of ground chia or flaxseed mixed with 1/4 - 1/2 cup warm water for a vegan option, though I have yet to try this myself. I recommend weighing your beets prior to grating - they should be 10 ounces in all. These burgers are pleasantly tender, but if they don't hold together well enough to fry them, try adding an extra egg, more quick oats, or some ground flax or chia seed to the burger mixture. A rest in the fridge will also help them hold together better. 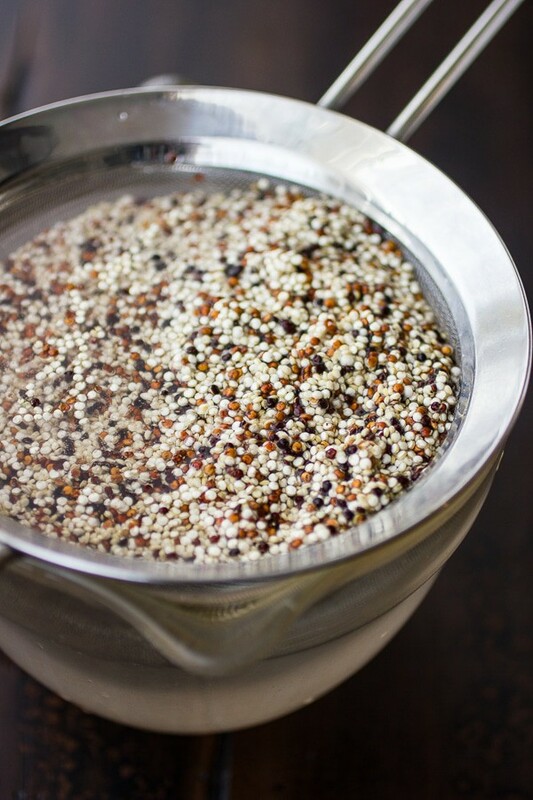 The quinoa, chickpeas and vegetables can all be cooked a day or two ahead of time. The burger mixture keeps well for several days in the fridge for on-demand burgers; you can also freeze the fried patties. These are heavenly on homemade Honey Oat Beer Buns, but feel free to use your favorite store-bought buns, or eat the patties atop a salad instead. Alanna is a freelance writer, food photographer, and recovering pastry chef based in San Francisco, and the mastermind behind the acclaimed recipe blog The Bojon Gourmet. (Bojon, or “no job” backwards, is not just a state of unemployment, but a state of mind. Read more about the Tao of Bojon here.) Follow Alanna on Facebook, Twitter, Bloglovin or Pinterest. As strange as it sounds, those are the prettiest hamburgers I’ve ever seen, ha! Thank you for this amazing delicious burger recipe. I have gastritis, I’m trying to heal my gut with a vegan diet. These were fantastic. I did make a few changes for personal taste and gut restrictions. I used half a can of black beans that I smashed slightly, omitted garlic because not tolerating currently and added salt and pepper to taste. I used an ice cream scoop and put the mixture in that and then put on a foil lined cookie sheet. Smashed down into burger shape and baked at 400 degrees for 15-20 minutes. I can’t tolerate the grease from pan frying so that’s why I baked. These are very healthy. I made 4 batches so I have to go for lunches and snacks on the go.